This morning I had an interesting twitter exchange with a friend that I respect a great deal. She always shares her heart, and she touches many with her talents. This morning she shared that she had had high hopes for 2013 – that it started in such a spectacularly good way, and then exploded, mid-year, in a similarly spectacular way – but not in a good way. She shared that although she survived the challenges 2013 threw at her, as she contemplated the beginning of 2014 she was not willing to expect much from the new year, lest it disappoint her in a similar way. Suffice it to say, I understand. This year started for me in an amazing way – that had me thinking this would be the “Best Year EVER!” And it was. Until it wasn’t. Mid year, I was challenged on every level. Physically, emotionally, and professionally. I found myself calling on a faith whose evolution I have so publicly shared with you. I even re-read my book, My 52 Weeks of Worship, Lessons from a Global, Spiritual, Interfaith Journey – 1 chapter, 1 each day – to remind myself of the experiences and the wisdom that guided me through the darkest period of my life so far – the year that inspired the My 52 Weeks of Worship Project. I contemplated what it truly means to be resilient. I recommitted to a daily meditation and prayer practice – in my own personal worship tradition (I will recommit as often as it takes). During that time of recommitting, daily, I read my last 2 My52WOW book club picks: In His Footsteps: Be Happy in Every Situation, Find Your Purpose and God, Walk Me Through This, by Tracy Vinson, one chapter a day. 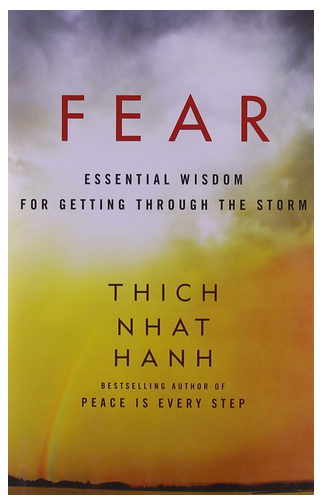 Renowned Zen master and Buddhist monk, Thich Nhat Hanh, explores the origins of fear and offers detailed practises on how to deal with its often toxic presence in our lives. Formed by a lifetime of mindfulness in action, he also shows us the path to peace, happiness and freedom that can come out of such explorations. For him, happiness is not found by suppressing our emotions but by purposefully living in a mindfully aware state. Only by practicing mindfulness in this way can we identify the source of pain that is responsible for our fear and anxiety, and cut it off from its roots so that the pain can subside. When we’re not held in the grip of fear, we can truly embrace the gifts of life. In 2014, I want to be someone who deals with fear as effectively as is possible – to see it, respect it, neutralize it, walk through it, and conquer its many faces. Even though my 2013 was challenging, I am encouraged. I can celebrate the personal and spiritual progress that has been made since The First 52 Weeks of this project. A thought is that: It’s said that the only thing more powerful and sustainable than fear is hope. It is my hope that you have a 2014 where fear does not rule your day. It is my hope that as you face the end of this year, you can see the progress you have made, even as you contemplate the challenges you experienced in the past year – and as you determine what you dare to hope for for next year.